The InfiniiVision 1000 X-Series uses Keysight's MegaZoom IV custom ASIC technology that enables 50,000 waveforms per second update rate. Keysight Technologies has introduced the InfiniiVision 1000 X-Series oscilloscopes in 50 to 100MHz models, which deliver professional-level functionality with software analysis and six-in-one instrument integration. Figure 1: The 1000 X-Series supports decoding and analysis of a wide range of popular embedded and automotive serial bus applications, that includes I2C, SPI, UART/RS232, CAN and LIN. 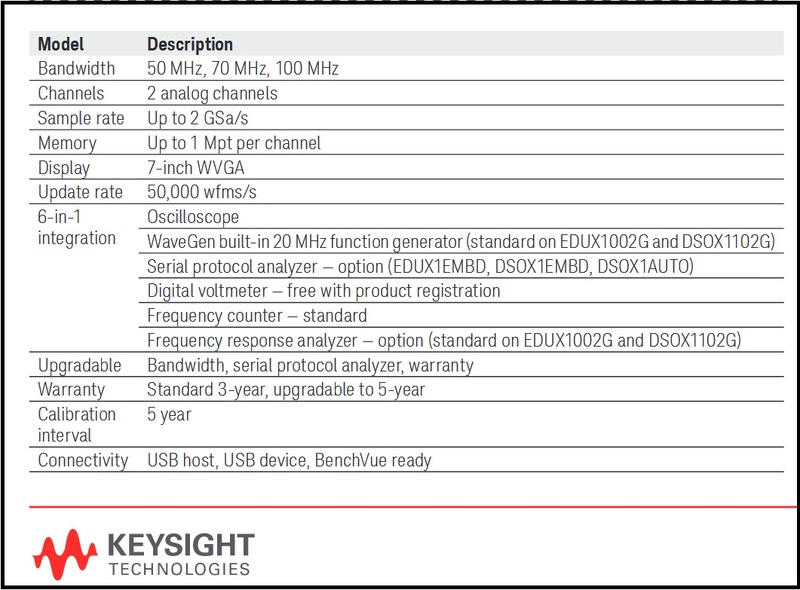 The 1000 X-Series uses Keysight's MegaZoom IV custom ASIC technology that enables 50,000 waveforms per second update rate. This makes it easier to see random and infrequent glitches and anomalies. The 1000 X-Series has a sampling rate of up to 2GSamples/s and comes with two probes. It uses segmented memory capability to maximise memory depth while helping the scope test faster. In addition to being an oscilloscope, the 1000 X-Series is also a serial protocol analyser, digital voltmeter and frequency counter—and the EDUX1002G and DSOX1102G models include a frequency response analyser and WaveGen function generator. The scope features 24 typical oscilloscope measurements to quickly analyse signals and determine signal parameters. Additional signal analysis is provided by the gated FFT function that allows users to correlate time and frequency domain phenomenon on a single screen. And mask limit testing is also available to help users easily detect signal errors. The 1000 X-Series support decoding, analysis of a wide range of embedded and automotive serial bus applications that include I2C, SPI, UART/RS232, CAN and LIN.